Calling all Volunteers – fancy painting a fence for us? 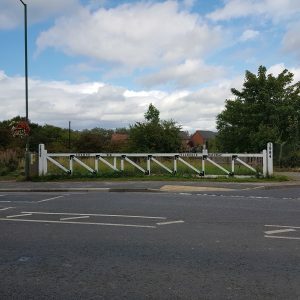 The Parish Council has been seeking quotes for undertaking the repainting of the Village crossings gate. The gate was erected to commemorate the life of the Clarence Railway Crossing. During the course of our efforts to advertise a request for quotes, we are delighted that a kind member of the community has said they would volunteer to help to do the work if a team of volunteers came forward. We are therefore looking for volunteers to undertake the painting work on behalf of our community. Would you be prepared to help prepare, prime and gloss coat the gate. It is not a massive job and small group of people would get the gate painted in no time. The Parish Council will provide necessary materials and light refreshments and volunteers are covered through our insurance. We need to get the work done by 20th September and in view of us we would need volunteers to be available to help on the weekends commencing 8th and 15th September. Prime, undercoat, and gloss Railway Gate in white at Commercial Road, Coxhoe. The work needs to ensure that the black lettering and gate detail be retained. Please will you note that we will need to see a copy of Public Liability insurance before the work is carried out.